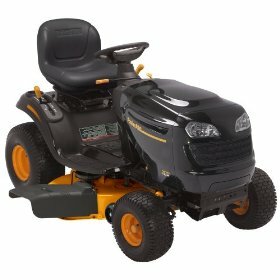 The Poulan Pro is an attractive lawn tractor that gives an okay cut, but forget about the tires! I bought this mover from Amazon.com for a great price. It was near the end of the season, and I had been mowing about 3 acres with a push mower, so I was pretty excited to get it. The first problem I had was getting it out of the crate. I am a 30 year old female, 133 lbs. and had a lot of trouble, finally resorting to using a crowbar to bust up the crate, then sawing the wood off under the front tires to get the thing onto the ground. Come to find out, inside the small box of parts inside the crate, under the seat, are instructions for opening the crate and removing the mower. Brilliant. The mower comes mostly assembled; you have to attach the steering wheel and seat, and that's it, so that is a plus. Now, my grass had grown for three weeks, in August, so it was pretty high. I ran the mower on the slowest setting and it did cut through it. There were a few places that required a second trip around, primarily where the grass had been over-seeded. My lawn is flat, with only a few trees, all of which are ornamentals. When I went to the shed to get my mower the next week, I had a flat tire. Lowes, and the other supply places around me do not carry tires for the Poulan Pro. In fact, the universal tires do not fit it either. A small stick, fibrous and thin, had somehow punctured the tire. The man who put the plug in for me was able to crush the twig between two fingers. I mowed my lawn a second time. I went to the shed the following week, and had a flat tire. It was the front tire this time. Another hole so small it was very difficult to find. Another plug. We don't know how this one happened. And that was the end of the season. As far as the cutting ability, if you can manage to keep the tires intact, you will find that thick grass, even if short, will have a mohawk in the center. You have to drive really slowly, or you end up with a striped lawn. All in all, I have a very nice looking machine with a great engine (Briggs and Stratton), but it does not give an even cut except in sparse grass, and my repairman referred to the tires as "thin". I can say, for the price, I like it. As long as plugs are only five dollars, it is still a good deal.